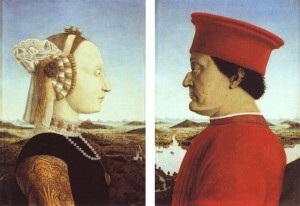 Piero della Francesca, arguably the finest painter of the Renaissance, painted a double image of the Duke and Duchess of Urbino facing each other. The Duke’s face is ruddy and he is robust. He must be painted in profile, as he is missing his right eye and has badly damaged his nose (as you can see!) in a jousting accident. Dressed in a red tunic, he is immediately identified as part of the elite. Only the learned and distinguished may wear the color red, a badge of honor. Portraits in the Renaissance need not capture the “essence” or personality of their subjects. But it was imperative that the subject’s affluence and honor were celebrated. The Duchess’ skin is pallid and lifeless. Art historians believe that she died before the portrait could be done and Piero painted her death mask. Husband and wife are locked in an eternal conversation and indeed their memory has not faded. Delve a little deeper into the Duke and Duchess’ painting! He is an incredibly talented Country Western musician from Texas. He will be 80 years old next year, 2013. He has been rich, broke, and rich again. Willie Nelson is an American icon who began his musical career at age eleven. He has won 10 Grammy awards for his outstanding achievements in composing and performing music. Nelson’s portrait was photographed by Annie Leibovitz, award-winning American photographer. Leibovitz is well aware that the 15th century Renaissance ideal of portraiture focusing on wealth and position is not relevant to the 21st century. She attempts instead to show her subject’s “essence”…a piece of his or her personality in her photographs. 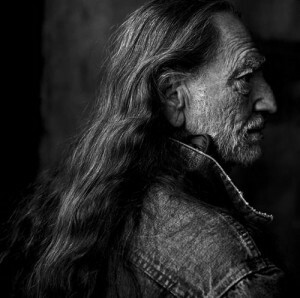 Hence, the unfiltered road map of creases in Willie Nelson’s face. Leibovitz’s photograph clearly and unabashedly captures a lifetime of hard living on the road and drug use. American presidents are the most powerful people in the world. American presidents are both honored and reviled. American presidents have their portraits painted for posterity. It is startling to see the ebullient portrait of Bill Clinton hanging next to the dark and solemn portraits of Abraham Lincoln and George Washington in the Smithsonian Museum, Washington, DC. 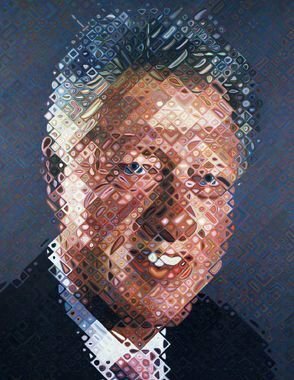 American artist Chuck Close captured Clinton’s charisma and presence perfectly with his unique combination of photo-realism and abstraction. In 1988, at the pinnacle of his painting career, Chuck Close suffered a collapse of his spinal artery which left him almost completely paralyzed. Although confined to a wheelchair, he has regained partial use of his limbs. The paint brush is strapped to his wrist. In the years since, Close’s position atop the American art world hasn’t changed. His work is met with rave reviews. In 2005, Chuck Close photographed Clinton and created a grid on canvas to match the photo. He then painted the image with thousands of bright colored modules. Voilà! President William Jefferson Clinton! You will like this “testimony” by the Duke of Urbano. Do look at this UTube link. “Faces Change…Portrait Change” – as does life and times … change. Stimulating process is this life we observe – from moment to moment, generation to generation, era to era, ad infinitum. Capturing this process in the context of art is both provocative and thoughtful. From the genius of the renaissance to the mundane of Willie Nelson – one of my favorites – we endlessly and unconsciously continue to change/evolve. Great piece, Kirby. Keep us thinking. Thank you Kirby. I enjoyed this. Thank you, Kirby. I enjoyed this.